Imaging is required to evaluate hip disorders in children. Imaging is the only way to establish a prognosis. The vast majority of hip problems in children can still be managed adequately by careful examination and conventional radiographs. Conventional radiography Evaluate most hip problems with conventional radiography. Except for the initial study, use a gonad shield. Obtain a single AP study. Several useful measures may be made from this simple study. Note any asymmetry in ossification of the pelvis. A painful condition such as an osteoid osteotomy results in hemideossification. Be aware of the situations in which false negative studies are commonly misleading. A negative study does not rule out DDH in the neonate or an early septic arthritis. An AP radiograph may not show a mild slipped capital femoral epiphysis (SCFE). Add other views as necessary. The frog-leg lateral allows comparison of both upper femora. The true lateral is useful in assessing the degree of slip in SCFE, the degree of involvement in Legg–Perthes disease, or anterior coverage in DDH. Useful special views include the abduction––internal rotation study for hip dysplasia, maximum abduction and adduction views for assessing hinge abduction problems, and anteversion studies. Femoral anteversion measurement is seldom necessary. Simple hip dysplasia The hip joint is either maldirected or shallow. Both reduce contact area. The depth of the acetabulum is often assessed by the CE angle. This angle increases during childhood as the joint ossifies. At the end of growth, values are like those of adults, with a normal range of 25°–45°. Features of the normal hip are used as a basis for assessing deformity and planning reconstruction. Incongruity reduces contact area The femoral head is normally round and matches the shape of the acetabulum. An aspherical femoral head is usually due to vascular problems. 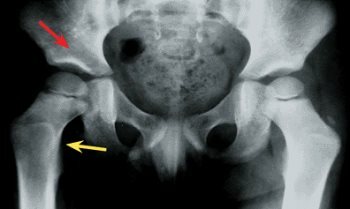 In the young child, the acetabulum usually remodels to become congruous, and the hip becomes aspherical and congruous. If acetabular remodeling fails to occur, the hip may be aspherical and incongruous—a bad combination. Displacement of the femoral head The relationship between the femoral head and acetabulum is normally congruous. If the head is displaced, it becomes subluxated. If all cartilage contact is lost, the joint is dislocated. Ultrasonography (US) Ultrasound studies are of greatest value when readily available and performed by an orthopedist in conjunction with the overall evaluation. Cost, restricted access, and operator inexperience may limit value. Ultrasound’s greatest potential usefulness is in assessing DDH in early infancy. Assessing joint effusion, localizing abscesses, and assessing the severity of SCFE, head size in LCP disease, and neck continuity in coxa vara are other applications. This imaging technique is underutilized in North America. Scintigraphy Bone scans (BS) are useful in localizing inflammatory processes about the pelvis and in assessing the circulation of the femoral head. Order high-resolution or pinhole-collimated AP and lateral scans of both proximal femora when assessing avascular necrosis (AVN). The bone scan is useful in confirming a preslip and assessing bone tumors. Arthrography The usefulness of this procedure is limited, as it is invasive and requires sedation or anesthesia. Arthrography is appropriate to confirm joint penetration in negative taps for suspected joint sepsis and for special situations in managing DDH. The role in LCP disease is more controversial. Magnetic resonance imaging These studies are the most expensive and require sedation for infants and young children. MRI studies are most useful in assessing intraarticular disorders of the hip. Cartilagenous loose bodies or fracture fragments, deformity of the cartilagenous femoral head, status of the growth plate, and avascular necrosis are usually definable. Computerized tomography (CT) Order CT studies to evaluate inflammatory conditions such as an iliopsoas abscess or the configuration of the upper femur and acetabulum. CT scans have replaced tomography in assessing AVN and physeal bridges. Three-dimensional CT reconstructions are often helpful in visualizing complex deformities of the hip, which is necessary when planning surgery.